St Andrews Place is a recently refurbished Grade II listed student accommodation halls perfectly located within 5 minutes walk of Liverpoool John Moores University, University of Liverpool, Liverpool Institute of Performing Arts and Liverpool city centre. 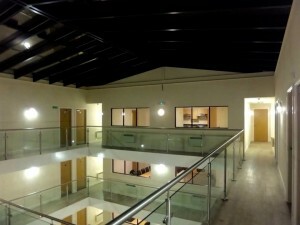 90 en suite rooms are located across 5 floors and set around a central atrium. All rooms are fully furnished and rents are inclusive of all utilities, high speed fibre optic Wi-Fi and free use of the on site gym and laundry facilities. Click the menus above for further information on our building, life as a student in Liverpool, booking conditions and more.